Most practitioners of arcane magic are either feared or respected by those who learn of their powers, for even the weakest sorcerer wields forces beyond what most humanoids can comprehend. 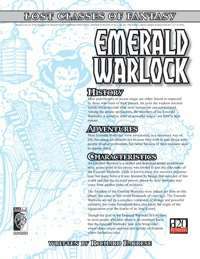 Among the arcane spellcasters, the members of the Emerald Warlocks a secretive order of powerful mages- are held in high esteem. Becoming an Emerald Warlock is no easy task. Before he can even begin to contemplate the idea of joining the secretive guild, a character must first prove that he is a mighty arcane spellcaster. Furthermore, the character must have great discipline, tremendous force of character, and the willingness to bring order to a chaotic world. Once a character meets these prerequisites, a member of the Emerald Warlocks contacts him. The character is then invited into the elite group, given a very special emerald lantern, and sent upon a quest by a high ranking official of the organization. Upon successful completion of this task, the character is anointed into the Emerald Warlocks. This four page Warrior Queen Prestige Class PDF is an easy-to-integrate PC class and just the sort of thing needed for DMs to add depth to any great d20 fantasy campaign world and gaming session. Written by Richard Farrese. This title was added to our catalog on November 29, 2006.